Shown from left are Paris Junior College athletes recently honored at an awards ceremony: Jaycie Pluenneke, Ashley Catlin, Miguel Reyes, Emily Wolfe, Devin Jackson, Garrett Moon, Nathan Hickey, Elizabeth Ahrens, Jordan Brown, Kierra Smith and Daija Styles. 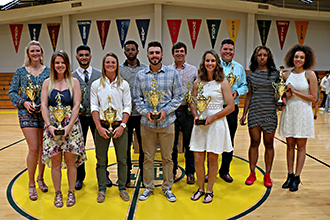 Paris Junior College athletes were honored at the PJC All-Sports Awards ceremony held recently in the Hunt Center. Coaches recognized their players and recapped seasons, then presented awards. The most valuable player for each team was recognized, as was the most valuable player in all sports and highest academic achievement among PJC athletes. Baseball player Nathan Hickey of Granbury received the McLemore Cup, the award given to the top athlete from all PJC sports. The right handed pitcher was a freshman All Conference player, Texas-New Mexico Junior College All Star, leads the conference in ERA, second in conference in strikeouts, fourth in nation in wins, member of Phi Theta Kappa and is an Academic All Conference player. Hickey was also co-winner of the Barney Bray Cup for baseball MVP with Garrett Moon of Rockwall. Moon was also a Texas-New Mexico Junior College All Star, was freshman All Conference player, member of Phi Theta Kappa, and seventh in the nation in getting hit by pitches. Softball player Elizabeth Ahrens won the Bobby Walters Cup, presented to the sophomore athlete with the highest grade point average. Ahrens, from Coppell, has a 4.0 GPA. The Women’s Soccer MVP was awarded to Ashley Catlin of Rowlett. She received Honorable Mention in NJCAA Region XIV in the fall and was team captain. Freshman Miguel Reyes of Amarillo received the Men’s Soccer MVP. He was team captain and named Region XIV First Team. He led the team in points and was third in the nation in penalty kicks - scoring four of four. The Don Wilhelm Cup for women’s basketball MVP went to co-winners Daija Styles of Dallas and Kierra Smith of Texarkana. Styles and Smith served as co-captains of the team. Freshman Devin Jackson of Houston received the Carroll Dawson Cup for men’s basketball MVP. He made Honorable Mention All Conference. Jaycie Pluenneke of Liberty Hill won the Volleyball MVP award. She was First Team All Conference in Region XIV North. The Vernon Carter Cup for softball MVP went to freshman Emily Wolfe of Houston. She had a .431 batting average, 19 doubles, 34 stolen bases, and was named First Team All Conference Infielder. Sophomore Jordan Brown of Mansfield was presented the Mickey Flippen Cup for golf MVP. He was named to the All District Team, after shooting 66-66 at the last tournament and was tied for sixth place.